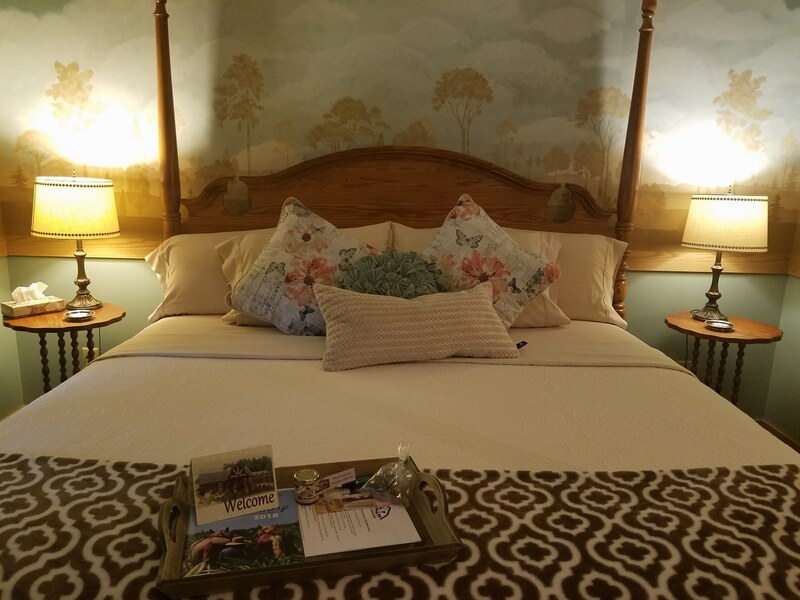 The comfortable and private atmosphere of this inn redefines the B&B experience, combining country charm, fine appointments, intimacy, and comfort, with personalized service and attention to detail. Amish County hospitality is served up with a sumptuous breakfast every morning. 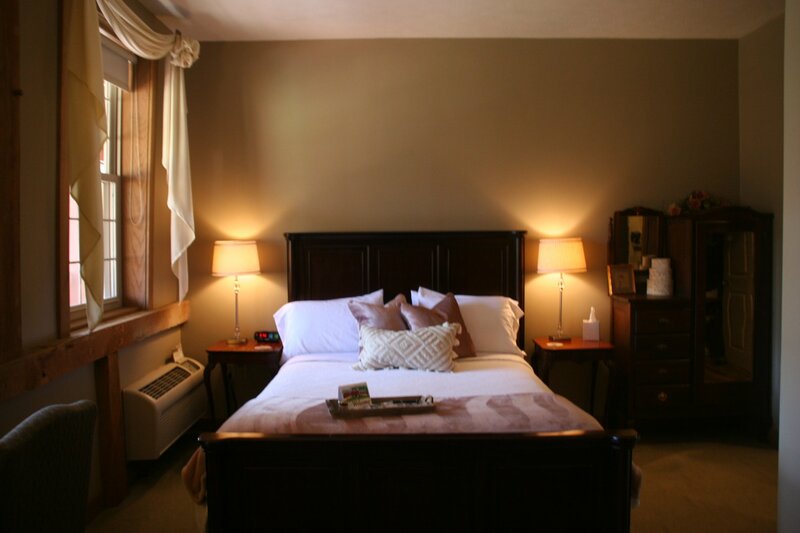 Each unique, private guestroom at our Amish Country Ohio inn features a private bath with a tub and shower, individual climate control, hair dryer, alarm clocks, in-room refrigerator, complete HD satellite TV, DVD/Blu-Ray player, WiFi throughout, an iron, and ironing board. Six suites have a Jacuzzi or jetted tub. Entrances are from the balcony and interior corridor. Plush beds are triple sheeted with high-quality, microfiber linens. Some rooms are provided with gas fireplaces (operational only seasonally, typically October - April), and some feature electric, simulated flame fireplaces, which may be operated year round. See Amenities page for a complete list of our features. Rates are based on single or double occupancy and vary by day of the week and season. The morning's sun brings the aromas of a complimentary farm-kitchen breakfast included with the price of your room. 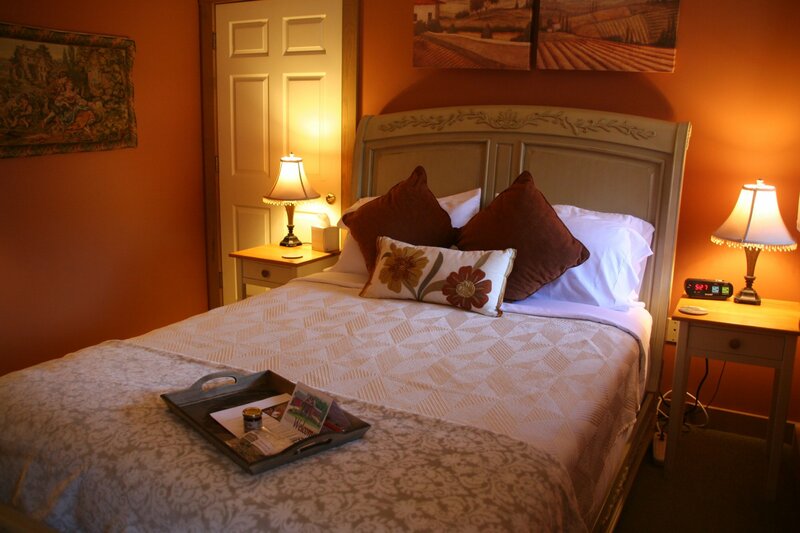 The Barn Inn Bed and Breakfast provides comfortable lodging and Amish-style cuisine to guests looking for a place to stay during their vacation, anniversary, birthday, other holiday, or weekend getaway. 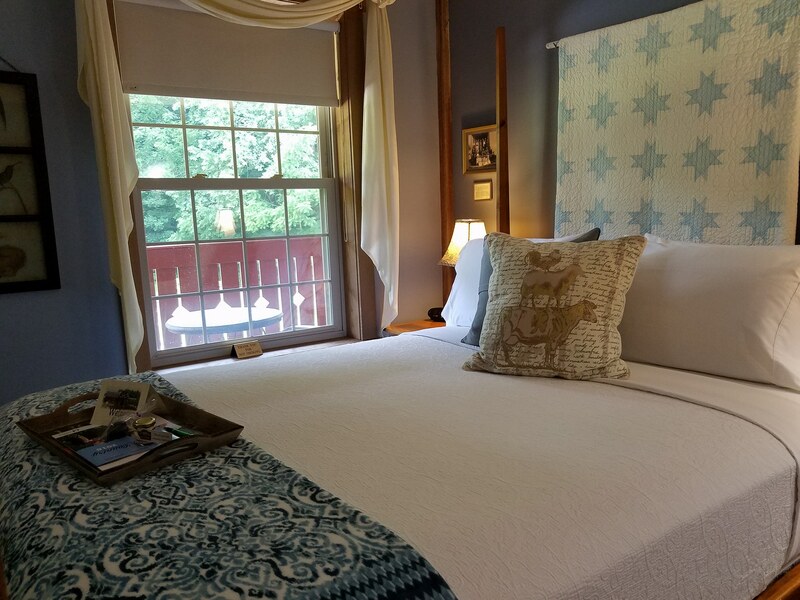 Our accommodations are centrally located between Columbus and Cleveland, Ohio, making it a great place to explore Amish Country near Berlin in Holmes County, Ohio. 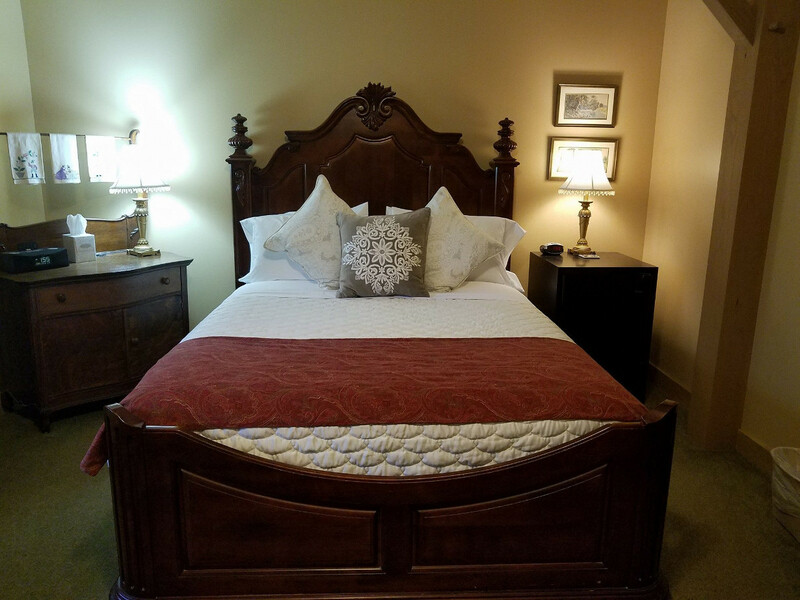 This deluxe standard room, conveniently located on the main floor, only steps from the great room, features a private bath with tub and shower, a queen sized bed, a comfortable chair, WiFi, TV, in-room refrigerator, rustic beams, and many other amenities. Has a beautiful in cabinet simulated electric flame fireplace. 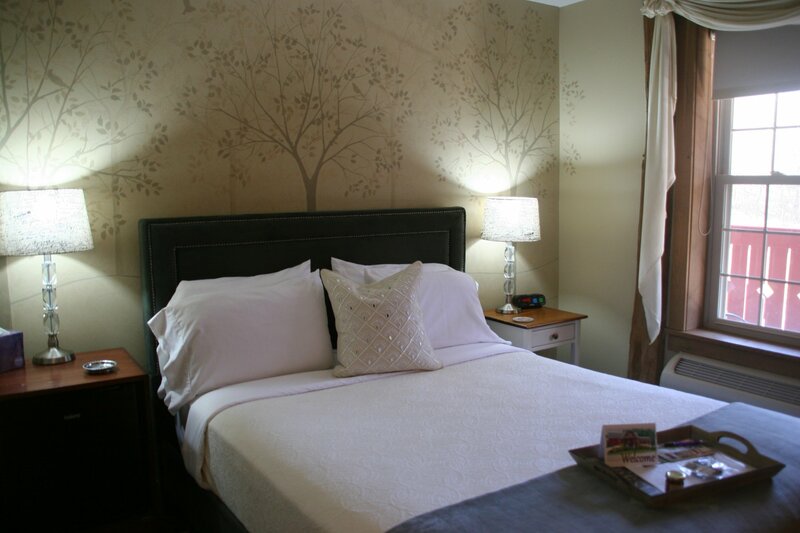 A soft, duvet cover with fine linens and triple sheeting provide a simple, tranquil atmosphere. This room has a private entrance from the common balcony and an interior corridor entrance. A full gourmet breakfast is included with your stay. This room requires no stairs and is well suited for persons with limited mobility. We have one handicapped parking space available on a first-come, first-serve basis. 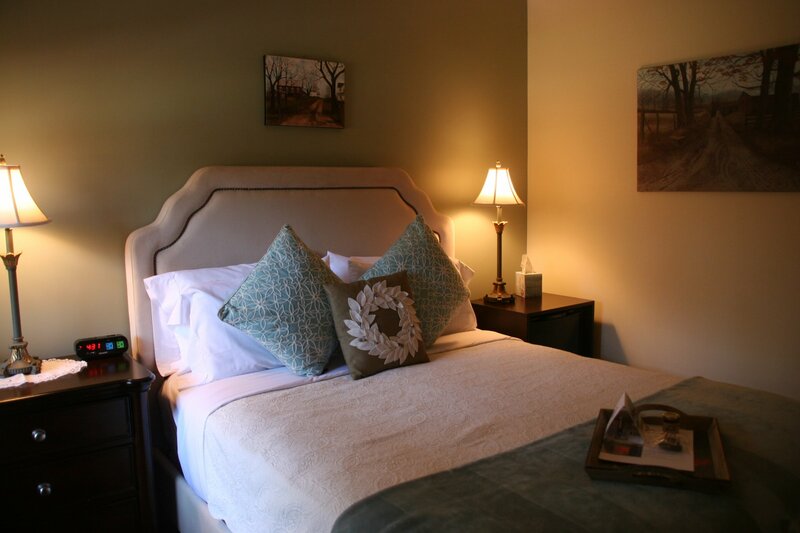 This favored deluxe standard room, often chosen for its exquisite hand-painted, almond-colored wall mural, is conveniently located on the main floor, is only steps from the great room, and features a private bath with tub and shower, a queen sized bed, a comfortable sitting chair and in-room refrigerator, WiFi, TV, and rustic beams. A full gourmet breakfast is included with your stay. This room has a private entrance from the common balcony and an interior corridor entrance. This room requires no stairs and is well suited for persons with limited mobility. We have one ADA handicapped parking space available at a first come first serve basis. 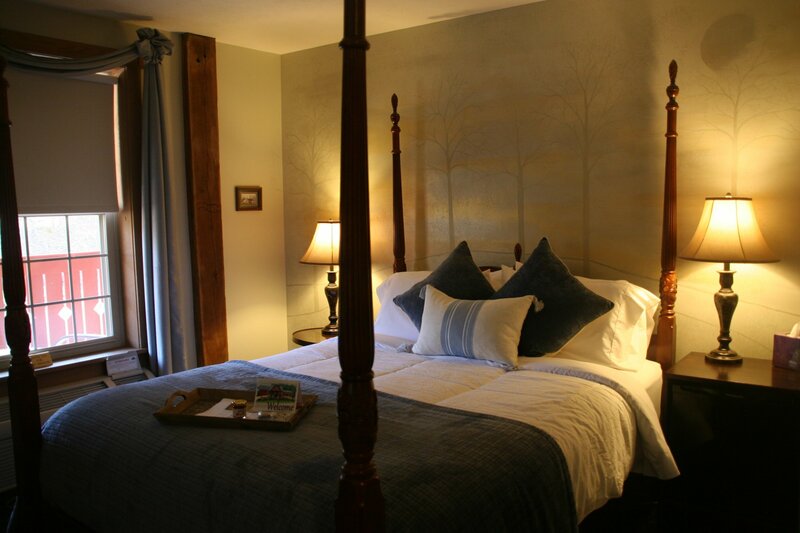 This deluxe standard room, often chosen for its exquisite hand-painted, sage-colored wall mural, is conveniently located on the main floor, is only steps from the great room, and features a private bath with tub and shower, a queen sized bed, a comfortable chair, in-room refrigerator, WiFi, TV, and rustic beams. A full gourmet breakfast is included with your stay. This room has a private entrance from the common balcony and an interior corridor entrance. This room requires no stairs and is well suited for persons with limited mobility. We have one handicapped parking space available at a first-come, first-serve basis. 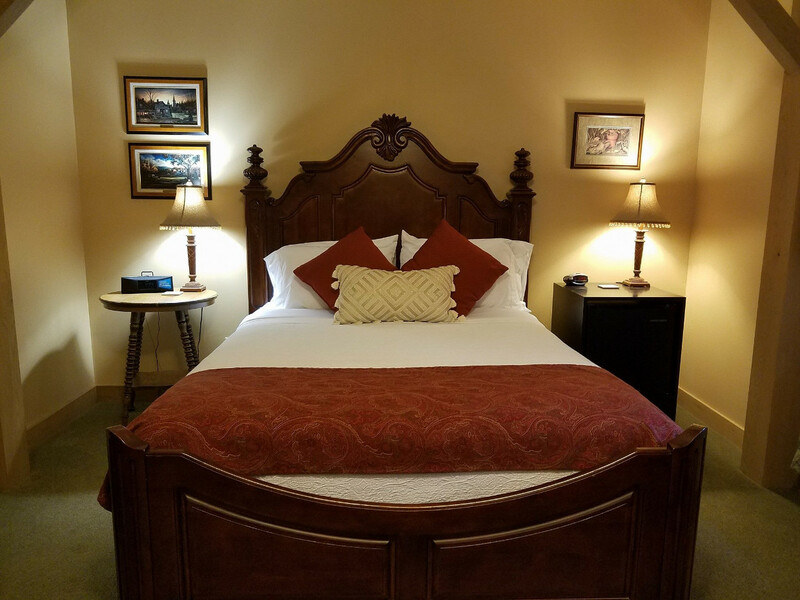 This deluxe standard room, located on the main floor, only steps from the great room and convenient to the handicapped parking space, features a private bath with tub and shower, a four-poster bed, a comfortable recliner, WiFi, TV, in-room refrigerator, and rustic beams. A full gourmet breakfast is included with your stay. Especially suited for persons with limited mobility, there are additional grip bars in the bathroom. This room has a private entrance from the common balcony and an interior corridor entrance. This room requires no stairs and is well suited for persons with limited mobility. We have one handicapped parking space available at a first-come, first-serve basis. This main-level West Wing VIP Suite offers timeless elegance, spaciousness, and comfort. Truly grand, the vaulted ceiling, architectural details, king-size bed, restored antique marble sink, extra large two-person whirlpool tub, double-wide shower, beautiful tile work (heated tile in the winter), full-size sofa, rocker recliner, gas fireplace, plush robes, WiFi, HDTV, in-room refrigerator, and additional amenities make this suite deserving of your special celebration; whether honeymoon, anniversary, or just simply because you need a get-a-way! A patio table and chairs on your porch provide a place for relaxation. Here, in view of the stone fountain, farm animals, and park, you will find refined luxury coexisting with nature. This room has a private entrance from the common balcony and an interior corridor entrance. We have one handicapped parking space available at a first-come, first-serve basis. A full gourmet breakfast is included with your stay. This main-level West Wing VIP Suite offers timeless elegance, spaciousness, and comfort. Truly grand, the vaulted ceiling, architectural details, king-size bed, restored antique marble sink, extra large two-person whirlpool tub, double-wide shower, beautiful tile work (heated tile floor in winter), full-size sofa, rocker recliner, gas fireplace, plush robes, WiFi, HDTV, in-room refrigerator, and hand-painted wall mural make this suite deserving of your special celebration; whether honeymoon, anniversary, or just simply because you need a get-a-way! 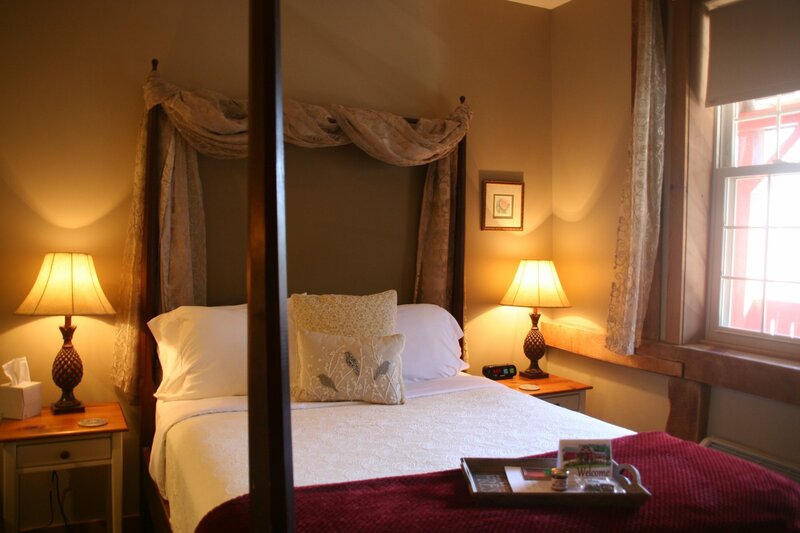 Located one floor above the main lobby and dining room in the original barn, the Rose Garden VIP Room, along with the above mentioned amenities, features a queen bed, a double-size, deep-soaker whirlpool tub, shower, WiFi, HDTV, in-room refrigerator, and rustic beams. A sleeper sofa bed provides great comfort for an additional person. A full gourmet breakfast is included with your stay. This room has a private entrance from the common balcony and an interior corridor entrance. This suite is on the second floor and requires guest to use stairs. No elevator access. 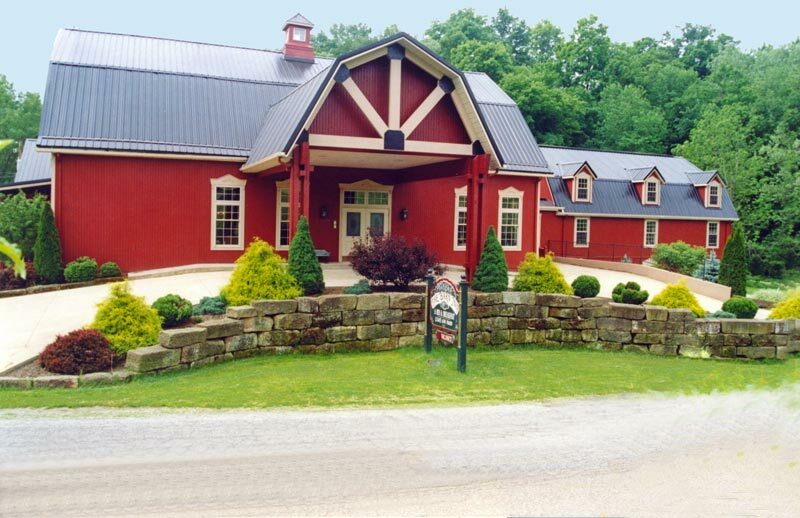 Located one floor above the main lobby and dining room in the original barn, the classic Camelot Room, with a private bath with tub and shower features a four-poster bed, comfortable reading chair, WiFi, TV, rustic beams, an in-room refrigerator, and many of the above mentioned amenities. The Camelot and French Country rooms, adjacent to each other, have adjoining doors, and may be shared with parties taking both rooms. A full gourmet breakfast is included with your stay. This room is on the second floor and requires guests to use stairs, it has a private entrance from the common balcony and an interior corridor entrance. No elevator access. 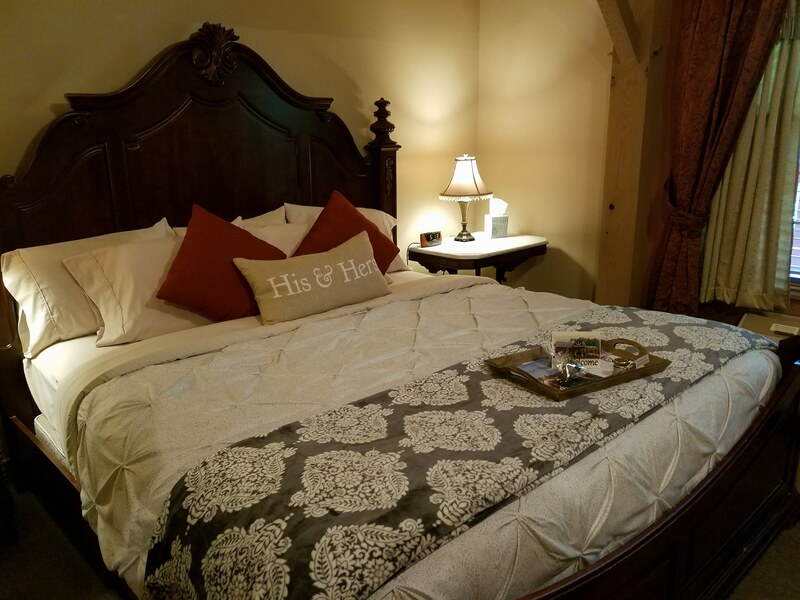 Located one floor above the main lobby and dining room in the original barn, the French Country VIP Room, along with the above mentioned amenities, features a queen bed, a single-person, deep-soaker whirlpool tub, shower, WiFi, TV and rustic beams. A hallway refrigerator is available. A twin-size sleeper sofa bed with a memory foam mattress provides great comfort for an additional person. A full gourmet breakfast is included with your stay. The French Country room and the Camelot room, adjacent to each other, have adjoining doors and may be shared with parties taking both rooms. This room has a private entrance from the common balcony it is on the second floor and requires guest to use stairs, and an interior corridor entrance. No elevator access. This garden-level West Wing VIP Suite offers timeless elegance, spaciousness, and comfort. Architectural details, a queen-size bed, extra-large two-person whirlpool, double-wide shower, heated tile floors in the winter, full-size sofa, rocker recliner, gas fireplace, soft robes, WiFi, HDTV, and additional amenities make this suite deserving of your special celebrations; whether honeymoon, anniversary, or just simply because you need a get-a-way! Comfortable timber-hewn rockers on your porch provide a view of the stone fountain, farm animals, and park; a serene setting where refined luxury coexists with nature. A full gourmet breakfast is included with your stay. This room and Country Charm, adjacent to each other, have adjoining doors and may be shared with parties taking both rooms. This garden-level West Wing VIP Suite offers timeless elegance, spaciousness, and comfort. Architectural details, queen-size bed, extra large two-person whirlpool, double-wide shower, heated tile floors in the winter, full-size sofa, rocker recliner, gas fireplace, soft robes, WiFi, HDTV, and additional amenities make this suite deserving of your special celebrations; whether honeymoon, anniversary, or just simply because you need a get-a-way! A patio table and chairs on your porch provide a place for relaxation. Here, in view of the stone fountain, farm animals, and park, you will find refined luxury coexisting with nature. A full gourmet breakfast is included with your stay. This room and Memory Lane, adjacent to each other, have adjoining doors and may be shared with parties taking both rooms.